The Scriptures tell us that it is as difficult to trace the path a sage pursues, as it is to draw a line marking the course a bird takes in the air while on its wings. Most humans must be content with a slow and laborious journey towards the goal. But a few are born adepts, flying non-stop to the common home of all beings: The Supreme Self. Mankind takes heart when such a sage appears, and though unable to keep pace with him, feels uplifted by his presence and has a foretaste of the felicity before which worldly pleasures pale into nothing. Countless people who went to Tiruvannamalai during the lifetime of Sri Ramana Maharshi had this experience. They saw in him a sage without the least touch of worldliness, a saint of matchless purity, a witness to the eternal truth of Vedanta. It is not often that a spiritual genius of Sri Ramana’s magnitude visits this earth. When such an event occurs, the whole of humanity benefits and a new era of hope opens before it. About thirty miles south of Madurai is a village — Tiruchuli by name — with an ancient Siva temple about which two great Tamil saints, Sundaramurti and Manikkavacakar, have sung. In this sacred village there lived in the latter part of the nineteenth century an uncertified pleader, Sundaram Aiyar with his wife Alagammal. Piety, devotion and charity characterised this ideal couple. Sundaram Aiyar was generous even beyond his means. Alagammal was an ideal Hindu wife. 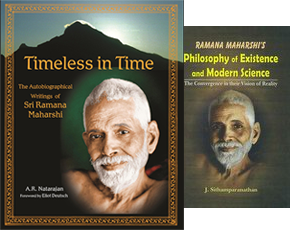 On the 30th of December 1879, to them was born Venkataraman — who later came to be known to the world as Ramana Maharshi. It was an auspicious day for Hindus, the Ardradarsanam day. On this day every year the image of the Dancing Siva, Nataraja, is taken out of the temples in procession to celebrate the divine grace of the Lord who made His appearance before such saints as Gautama, Patanjali, Vyaghrapada, and Manikkavacaka. In the year 1879, on the Ardra day, the Nataraja image of the temple at Tiruchuli was taken out with all the attendant ceremonies — and just as it was about to re- enter, Venkataraman was born. There was nothing markedly distinctive about Venkataraman’s early life. He grew up an average boy. He was sent to an elementary school in Tiruchuli, and then for a year’s education to a school in Dindigul. His father died when he was twelve years old. This necessitated moving to Madurai with the family to live with his paternal uncle, Subbaiyar. There he was sent to Scott’s Middle School and then to the American Mission High School. He was not at all serious about his studies, an indifferent student. But as he was a healthy and strong lad; his schoolmates and other companions were afraid of his strength. Any time some of them had any grievance against him, they would dare play pranks with him only when he was asleep. In this extremely deep sleep, he was rather unusual: he would not know of anything that happened to him during sleep. He would be carried away or even beaten without his waking up in the process. It was apparently by accident that Venkataraman heard about Arunachala when he was sixteen years of age. One day an elderly relative called on the family in Madurai. The boy asked him where he had come from. The relative replied 'From Arunachala'. The very name 'Arunachala' acted as a magic spell on Venkataraman, and with evident excitement he put his next question, 'What! From Arunachala! Where is it?' And he got the reply that Tiruvannamalai was Arunachala. Referring to this incident later, the Sage says in one of his hymns to Arunachala: 'Oh, great wonder! As an insentient hill it stands. Its action is difficult for anyone to understand. From my childhood it appeared to my intelligence that Arunachala was something very great. But even when I came to know through another that it was the same as Tiruvannamalai I did not understand its meaning. When, stilling my mind, it drew me up to it, and I came close, I found that it was the Immovable.' Quickly following the incident, which attracted Venkataraman’s attention to Arunachala, there was another event that also contributed to the turning of the boy's mind to the deeper values of spirituality. He chanced to lay his hands on a copy of Sekkilar's Periyapuranam, which relates the lives of the Saiva saints. He read the book and was enthralled by it. This was the first piece of religious literature he read. The example of the saints fascinated him; and in the inner recesses of his heart, something responded favourably. Without any apparent preparation, a longing arose in him to emulate the spirit of renunciation and devotion that constituted the essence of saintly life. The spiritual experience for which Venkataraman was now devoutly wishing came to him soon, and quite unexpectedly. It was about the middle of the year 1896; Venkataraman was seventeen then. One day he was sitting up alone on the first floor of his uncle's house. He was in his usual health — there was nothing wrong with him. But a sudden and unmistakable fear of death took hold — he felt he was going to die. Why this feeling should have come to him he did not know. The feeling of impending death, however, did not unnerve him. He calmly thought about what he should do. He said to himself, "Now, death has come. What does it mean? What is it that is dying? This body dies". Immediately thereafter he lay down, stretching his limbs out and holding them stiff as though rigor mortis had set in. He held his breath and kept his lips tightly closed, so that to all outward appearance his body resembled a corpse. Now, what would happen? This was what he thought: "Well, this body is now dead. It will be carried to the burning ground and there burnt and reduced to ashes. But with the death, of this body am I dead? Is the body I? This body is silent and inert. But I feel the full force of my personality and even the voice of the 'I' within me, apart from it. So I am the Spirit transcending the body. The body dies but the Spirit that transcends it cannot be touched by death. That means I am the deathless Spirit". 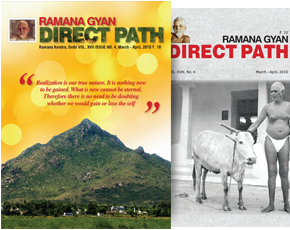 As Bhagavan Sri Ramana narrated this experience later on for the benefit of his devotees it seemed as though this was a process of reasoning. But he took care to explain that this was not so. The realization came to him in a flash. He perceived the truth directly. 'I' was something very real, the only real thing. Fear of death vanished once and for all. From then on, 'I' continued like the fundamental sruti note that underlies and blends with all the other notes. Thus young Venkataraman found himself on the peak of spirituality without any arduous or prolonged sadhana. The ego was lost in the flood of Self-awareness. All of a sudden the boy that used to be called Venkataraman had flowered into a sage and saint. There was noticed a complete change in the young man's life. The things that he had cared for earlier completely lost their value. The spiritual values, which he had ignored till then, became the only objects of attention. School-studies, friends, relations — none of these had now any significance for him. He grew utterly indifferent to his surroundings. Humility, meekness, non-resistance and other virtues became his adornment. Avoiding company, he preferred to sit alone, all absorbed in concentration on the Self. He went to the Minakshi temple every day and experienced exaltation every time he stood before the images of the gods and saints. Tears flowed from his eyes profusely. The new vision was constantly with him. His was the transfigured life. Venkataraman’s elder brother observed the great change that had come upon him. On several occasions he rebuked the boy for his indifferent and yogi-like behaviour. About six weeks after the great experience came the crisis. It was the 29th of August 1896. Venkataraman’s English teacher had asked him, as a punishment for indifference in studies, to copy out a lesson from Bain's Grammar three times. The boy copied it out twice, but stopped there, realizing the utter futility of that task. Throwing aside the book and the papers, he sat up, closed his eyes, and turned inward in meditation. The elder brother who was watching Venkataraman's behaviour all the while went up to him and said: "What use is all this to one who is like this?" This was obviously meant as a rebuke for Venkataraman’s unworldly ways including neglect of studies.